An Experience With, a leading events management company specialising in immersive celebrity interview experiences in the UK, appointed PR Agency One to handle the PR for its event with “the notorious” Conor McGregor. 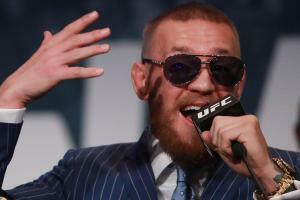 The MMA superstar and media circus that is McGregor was set to host a black tie dinner and live interview with prolific MMA journalist, Ariel Helwani, at EventCity, Manchester for 5,000 fans. PR Agency One was tasked with informing the UK and the world that the event was taking place in Manchester, drive ticket sales, create a buzz and prompt conversation, as well as increase awareness of the event’s digital offering for those who did not have tickets. With just six weeks until Conor McGregor arrived in Manchester, the race was on to deliver a PR campaign with big impact. PR Agency One engaged with news desks and sports journalists from all around the world across numerous time zones to cover the build-up to the event and promote the online live stream, which was available around the globe for those who were not lucky enough to have a ticket. Liaising with Conor McGregor’s management company in both the UK and LA, to agree exclusive interviews, photography rights and managing the media frenzy was all in a day’s work. In addition, the team managed the stringent press accreditation process including vetting, reviewing and liaising with relevant media during the run up to the event, as well as hosting the VIP journalist table and managing media on the night.